Paper Crafts by Candace: The Pink Elephant - First submission as a DT Member! The Pink Elephant - First submission as a DT Member! 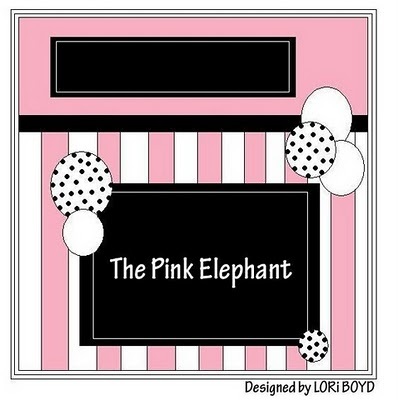 I am a Pink Elephant Scrap Team designer! This is my first layout for them. Let me tell ya, I am intimidated by all the great scrapbookers that are on the team. They are all soooo good! Anyways, this weeks challenge over at The Pink Elephant was to create a scrapbook layout using this sketch. I actually decided to flip this sketch on its side. And here is what I came up with! This is my neice listening to music with her papa's earphones. 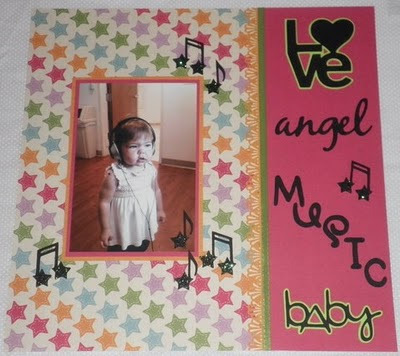 The music notes are cut from Hannah Montana, Love is from Home Accents, Angel is from Graphically Speaking and Music and Baby are from All Mixed Up. Make sure to check out everyone elses work over at The Pink Elephant! She's adorable! I love the star music notes with the star paper, great touch! So cute! I love the title! It's so 'Gwen Stefani'! lol :) makes me smile!